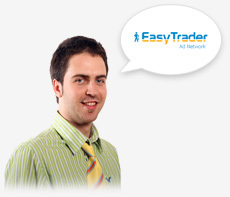 EasyTrader Bulgarian widely used platform for managing Internet advertising simultaneously across multiple websites. With EasyTrader You can buy advertising such as "pay per click" in the popular and visited sites in Bulgaria. Efficiency and accountability are high, ensuring a good success of your product or image banner ad. Premium Network - includes the most popular web sites with news and events as Standartnews.com, Dariknews.bg, News.bg, Focus-News.net, 24chasa.bg, Capital.bg, Dnevnik.bg, Novinar.bg, Money.bg and many others. Enjoy simultaneous presence in them by paying only for actual visitors who click your ad. VIS Network - together Start.bg, Bgtop.net, Vsi4ko.bg, Topimot.bg, Album.bg, Vbox.bg, Sibir.bg, Atol.bg, Elmaz.com, Sladur.com, Gepime.com and many others. Display your ads on sites with quality Bulgarian multiple user traffic and monitor statistics in real time. Extreme Network - contains 20 groups of websites arranged in thematic categories or directed to specific niches. Target to contextually liked by Consumer Content. Social Network - collect all the social networks like Album.bg, Asl.bg, Atol.bg, Data.bg, Elmaz.com, Sladur.com, Far.bg and others. Increase awareness of products and services and the city image among people. Please fill Contact form, to send you more detailed information and specific proposal on how to get into advertising network EasyTrader!